Present at the Mass were the families of at least 13 of the victims and other former residents of the Tower. Also present with the parish community were some of the hundreds of volunteers who assisted at St Francis in the immediate aftermath of the fire last year. They were joined by ecumenical guests Rev Dr Alan Everett from St Clement and St James Anglican Church and Rev Dr Mike Long from Notting Hill Methodist Church. After the Mass the Cardinal and the congregation gathered in the courtyard outside the church where Fr Gerard Skinner, the Parish Priest of St Francis, together with Imam Fahim Mazary from the Al-Manaar Muslim Cultural Heritage Centre and Yusuf Al-Khoei from the Al-Khoei Foundation read out the names of all who died due to the fire at Grenfell Tower, followed by 72 seconds of silence. After the silence the Cardinal blessed a plaque and a statue that commemorate the 15 children, women and men of the parish who died at Grenfell Tower. Of your charity, pray for the repose of the souls of the victims of the Grenfell Tower fire, 14 June 2017. The statue above this courtyard has been erected in memory of those of this parish who died during the fire. The statue is of the Madonna and Child and has been carved by Mr Graham Heeley. Of the names recorded on the plaque 13 mothers and fathers have lived to see the death of a son or daughter (eight mothers and five fathers) and two mothers died with their child. After consulting the families of those who died, the image of Mary with her infant Son, Jesus, was chosen as a fitting memorial to those who died and as a comfort to those who survived. The two figures convey the compassion of a mother and the gentle encouragement and love of her son. 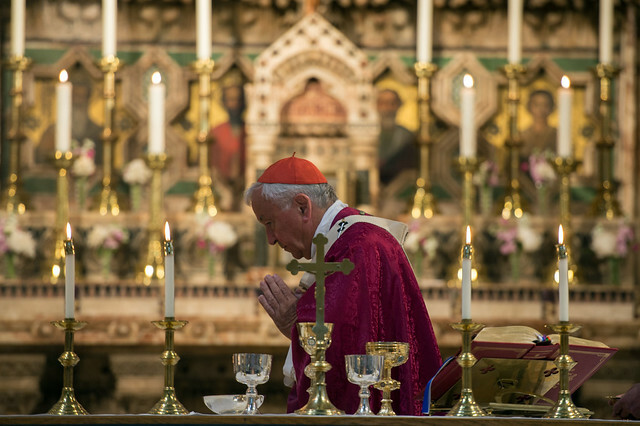 After the service, the Cardinal met some of the families and reflected that the Mass was ‘deeply heartfelt and full of emotion’. He expressed his hope that ‘it has brought some healing’ even as the inquiry continues. You can look through a gallery of images from the visit on our Flickr Photostream.